It’s natural to dream of a summer or autumn holiday abroad, where you can kick back, relax and enjoy the hot weather rather than having to deal with our fluctuating “summers”. Traveling Turkey on a budget doesn’t necessarily mean scrimping on quality – you’ll still come home having an unforgettable time, without having to spend months trying to make back the money you spent. Turkey is a prime location for British holiday makers – just a few hours away and offering long hours of sunshine, miles of beautiful beaches and plenty of history and culture to explore. It’s easy to see why people make a return journey year after year, with plenty of resorts spanning all tastes and interests. To stay one step ahead and keep costs down, you need to be as organised as possible. From the moment you book your holiday, you can ensure that your break doesn’t overstretch the budget by booking dates that aren’t part of the peak season and choosing a board basis that is cost-effective and value for money. It is easy to assume that all inclusive means spending less, but this isn’t always the case – weigh up the pros and cons of the various board options so that you know you’re making the most of your choice. A Turkish holiday wouldn’t be complete without a visit to one of the local bazaars – if you choose to buy, make sure you barter to keep costs low and guarantee walking away with a bargain. 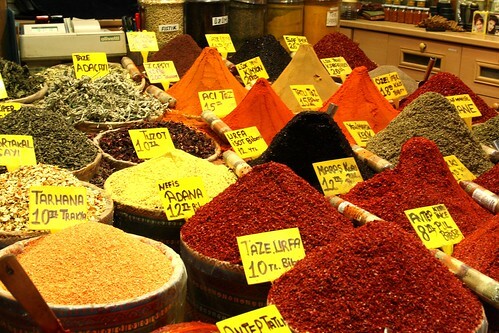 You can pick up some excellent produce here, including spices such as saffron that would cost a fortune back in the UK. If you choose to head into town, opt to ride the dolmus for pennies rather than hopping in a taxi – it’ll save you cash that can be spent elsewhere. Much of what Turkey has to offer is completely free – the beaches, the coves and the beautifully picturesque strolls don’t cost a penny. If you do decide to invest in an excursion or two, try to organise and book these in advance to avoid paying on-the-day prices. You don’t have to spend over the odds for a Turkey holiday to remember – start planning your next budget travel break, today. Great information, Carrie. Turkey is definitely on our Travel bucket list and I loved all of your valuable tips on traveling on a budget. Those spices looks amazing! Useful info. Turkey is on our list for our upcoming RTW- I visited once in 2007 but only for a couple days to Kusadasi. Looking forward to exploring other areas of the country.